It was not ideal weather for seal watching. The wind coming off of Rome Point was strong and unflagging, pressing against my back, gently pushing me towards the water’s edge. From the shoreline, the rocks where seals typically lie appeared as nondescript grey specks. Seals prefer calm, sunny days where they can bask in the warmth while the rocks heat up beneath them. Rome Point is a small nature preserve in North Kingstown; a dirt path leads you through the sparse forest and opens up onto a rocky beach. I had traversed the rocks on a chilly evening at sunset because harbor seals are Rhode Island’s official state marine mammal, figuring prominently in local narratives about marine conservation, and Rome Point is one of the most trafficked seal-watching sites in the state. From November to April each year, a visitor to Rome Point can almost surely expect to see seals hauled out on rocks offshore. I squinted over the water at the rocks, and began to dig through my bag to find the binoculars I had borrowed for the day. Every November, as temperatures begin to fall, harbor seals start to show up in the waters off of Rome Point, and all across Narragansett Bay. They swim south for the winter from their breeding grounds off the coasts of Maine and southeastern Canada. After spending a winter in the relative warmth of Rhode Island, they migrate north again come May. Not much is known about the seals’ local ecology while they’re in the bay: what they eat, what eats them, and their ecological significance—and by extension the bay’s capacity for long-term population sustainability—largely remain a mystery. And their charisma is unimpeachable. They have impossibly large black eyes and whiskers, are lovably lazy on land, and lithe and graceful in the water. Most consequentially, though, their population has rebounded from a critically low level over the last 50 years. That has led some to see harbor seals as a legislative success story, a highly visible bright spot in an often-dark discourse surrounding conservation. Whether that narrative of success serves as a model for effective, publicly-driven legislation on conservation or an ineffective fixation that draws attention away from more nuanced ecosystem-wide problems remains an open question. Ecologically speaking, Narragansett Bay is limited. Instead of creating deep waters necessary for complex forms of life, recent ice ages leveled and scoured the bottom of the bay, leaving its average depth a mere 26 feet. The highest attainable degree of biological and ecological complexity is limited by these shallow waters—for organisms that live here, lifespans, reproductive cycles, and food chains are relatively short. This geological lack of complexity continues to be compounded by human industrial activities. Narragansett Bay was one of the estuaries most affected by unchecked development. Rhode Island was the cradle of the Industrial Revolution in the United States, and the state is still grappling with the environmental legacy of that history and industrial development more broadly. In 1989, an oil tanker called the World Prodigy ran aground off Newport’s shore, leaking 300,000 gallons of oil. Until the early 2010s, Providence’s combined sewer overflow directed raw sewage into the bay. Narragansett Bay was a prime dumping ground for industrial waste and runoff, which drove away or killed off many species and limited the ecosystem beyond the constraints imposed by the shallow water. Abundant harbor seals were hunted by Native Americans and early European colonists for meat, leather, and oil. As commercial fishing became more prominent in the area, seals were perceived as competition for fish stocks, leading Massachusetts and Maine to put a bounty on seals from 1888 to 1962. The financial incentive to hunt seals depleted their populations, which reached a low point in the 1960s. In 1972, the Marine Mammal Protection Act made seals a federally protected animal, and they have quickly bounced back. Now, their population is relatively stable—they aren’t listed as endangered by federal or state authorities, and are a species of “Least Concern” according to the International Union for the Conservation of Nature, the world’s largest conservation network. The key to understanding the narrative power and symbolism of harbor seals and their relationship to conservation in Rhode Island lies in this exceedingly neat story. It’s a narrative of successful problem-solving presented by organizations that want to showcase their ability to solve other ecological problems. In this version of events, decisive human action by the state saved a species on the brink, which has gone on to serve as a proxy for conservation in Narragansett Bay generally. Now, at least two companies in Rhode Island offer weekly paid seal-watching tours, and since 2008 seal-watching enthusiasts have chronicled, in a well-updated online blog, seal counts and behaviors. There are viral videos of thousands of seals beaching in southern Massachusetts. Save The Bay is the largest environmental group in Rhode Island, with a focus on marine conservation. Since the 1970s, Save the Bay has conducted local environmental advocacy, educational programs, and volunteer habitat restoration. Since 1994, they have run an annual bay-wide volunteer seal count, and produce a well-publicized report on harbor seals every year. There’s just one problem: the neat narrative produced by placing seals front and center isn’t the whole truth. Though they may be highly visible, using them as the charismatic mascots addresses only a small, migratory part of the ecosystem. The seal population may be stable, but the bay still faces invasive species of grass invading local salt marshes, persistent algae blooms that deplete areas of oxygen, recreational and commercial overfishing, widespread predator depletion, and the ever-present threats of climate change. The waters of Rhode Island are facing as many complex and existential ecological issues as ever. These issues speak to a larger conflict over the narrative direction of the conservation movement. Broadly speaking, there are two ideological camps: one that emphasizes public engagement and flexing political will (we’ll call them the conservation idealists, or conversely the nonprofit realists), and one that emphasizes deep scientific knowledge and well-informed technocratic decision-making (we’ll call them the conservation realists, or conversely the nonprofit idealists). Both recognize the complex, pressing, and systemic problems at stake when we talk about conservation—but the conflict over which approach becomes dominant remains. Save The Bay’s work mostly falls into the conservation idealist, public-facing engagement camp. July Lewis, Save the Bay’s volunteer coordinator, has short brown hair and plastic-rimmed glasses, and each impassioned anecdote she delivers seems to energize her. She is in charge of coordinating and compiling the annual bay-wide seal count. “[Seals are] charismatic megafauna, those big animals that people really gravitate to,” she says. “They’re sort of symbolic of the environment you want to protect.” Although the hard science backing up Save The Bay’s conservation effort is critically important to her, she notes that the seals are “also a talking point about how alive the bay is” for her organization. Educating people about a thriving and charismatic species means they will be more likely to protect and keep the bay clean, she says. Lewis is sympathetic to the ongoing plight of less charismatic species throughout Narragansett Bay but realistic about the likelihood of mounting successful awareness campaigns on these grounds alone. “We’re going to talk about seals whether they’re in trouble or not, because they’re very appealing, and they’re very cool, and they’re a success story,” she says. “For other organisms that don’t have the charismatic qualities of a marine mammal, we will talk about them if they’re specifically in trouble or if there’s something we can specifically do to help them.” In other words, the less visible members of the ecosystem—the crabs, clams, small fish, and algae—have a harder time standing on their own. Despite the fact that salt marshes are a buffer against sea level rise and storm surges, it’s difficult to elicit empathy by pointing to widespread salt marsh loss, because that habitat degradation has happened slowly, over the course of centuries. When Bertness talks about “foundation species,” he’s talking about the myriad small (sometimes microscopic) organisms that make up the lowest trophic levels of an ecosystem. Some of these species, like algae and plankton, are photosynthetic and serve as the basic food source of nearly every other organism in the food chain. One example of the impact of local environmental policies on foundation species is wastewater treatment plant runoff. This runoff is largely responsible for high levels of nitrogen and phosphorus in the bay, and in the right conditions, these excessively nutrient-rich waters can lead to seasonal algae blooms, which in turn create oxygen-deprived dead zones in the bay. Species that can’t move from these oxygen-free zones often die in the process. The impact of these organisms is huge—it’s safe to say they are the base upon which the entire ecosystem rests. Lewis’s narrative is guided by an understanding of how to tell cohesive and compelling stories of success to human stakeholders, even if those stories elide some critical details about the health of the Rhode Island’s waters. These kinds of stories galvanize people to care about their local marine environment and, just as importantly, they contribute to the long-term sustainability of an important conservation organization that has historically done consequential work. Conversely, Bertness’s narrative is guided by a keen awareness of what has been overlooked: a detail-oriented perspective focusing on the importance of the ecological foundations of the bay. But that perspective is an unrealistic model for creating nonprofits that are financially sustainable and capable of functioning long-term. Bertness bridges this dilemma by considering his role in the discourse of conservation to be that of truth-telling advisor. His job isn’t to sugarcoat reality, it’s to describe it. “If you’re going to be somebody… that informs conservation groups like The Nature Conservancy—national organizations—you gotta be honest with them. If they don’t know the truth, how are they going to manage things?” He doesn’t consider his audience to be the public; instead of motivating people to act, he seeks to inform and direct the structural basis of the conservation dialogue more broadly. In practice, that looks like deemphasizing the ecological role of seals (and the resulting necessity to center them in conservation) in favor of more nuanced problems. Regardless, harbor seals are back, and it seems like they are here to stay. Between 1981 and 2001, the seal population increased at a yearly rate of 6.6 percent.The pup count also increased, at a rate of 14.4 percent annually during this period. Despite some worries about recent seal epidemics leading to some mass die-offs, the bay-wide seal counts have recorded only small fluctuations in population in recent years. It’s hard to get people to connect with the sea. We can’t see into an ocean’s depths, or navigate its waters with the ease we feel on land. Unpredictable tides, waves, and winds constantly remind us how illusory our land-based sense of autonomy and control is. It is in this context that our culture fixates on marine mammals like seals. The thought that something warm-blooded and cute, with eyes that reflect a glint of our own humanity back at us—something “like us,” for lack of a better term—can thrive in such a hostile environment provides some comfort and an avenue for connection. Back at Rome Point, I finally found the binoculars I was searching for at the bottom of my bag. I raised them to my eyes and squinted through them towards the rocks that were known as common seal haul-outs. As the rocks 200 yards away came into focus, my breath caught for a second. Two seals lay there. They weren’t doing much, to be completely honest. But let me tell you, even from afar they were really cute. 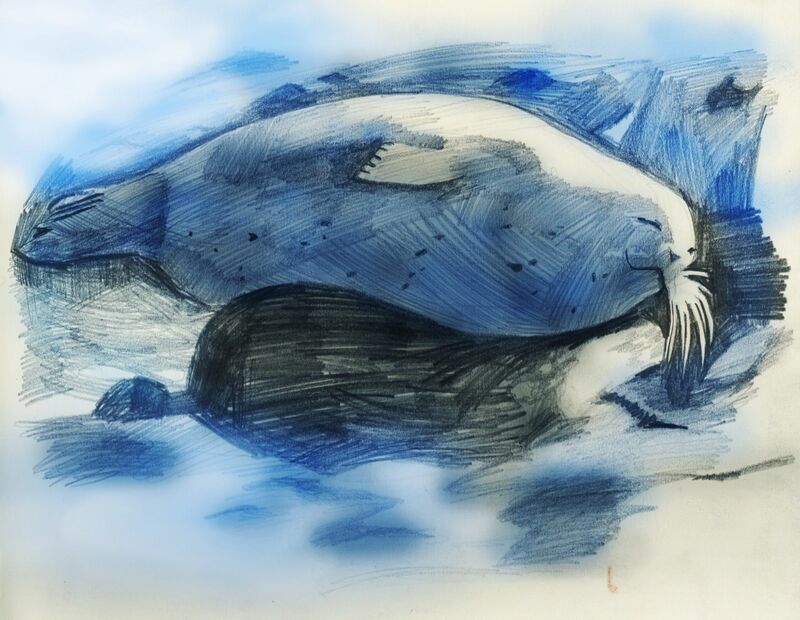 HAL TRIEDMAN B ‘20.5 wants you to know that you should never get too close to seals while they’re resting on a rock—it’s a violation of the Marine Mammal Protection Act.